As virtual reality catches on, companies are getting more creative in making the VR experience more immersive. The other day we reported on a device called the Mask that can sense your facial expressions and translate them to a computer avatar in real time. This advancement could make social interactions within virtual worlds more realistic. Now a company called Contact CI is working on a glove that uses advanced haptic feedback to simulate the sensations of touching and picking up virtual objects. Haptic feedback, or just haptics, is the application of tactile sensation to computer applications. For example, any device with a vibrate function could be programmed to signal a very short vibration whenever a key is pressed. Add to that an audible clicking sound effect, and you get a sensation when using the on-screen keyboard that feels more like a physical keyboard. Digital Trends reports that Contact CI wants to take haptics to the next level with its Maestro glove. The Maestro is designed to work with a VR headset and uses motors to create resistance when the user is manipulating objects in the virtual world. So for example, you could pick up a sword in a game, and it would feel like you were gripping a handle rather than making a fist. 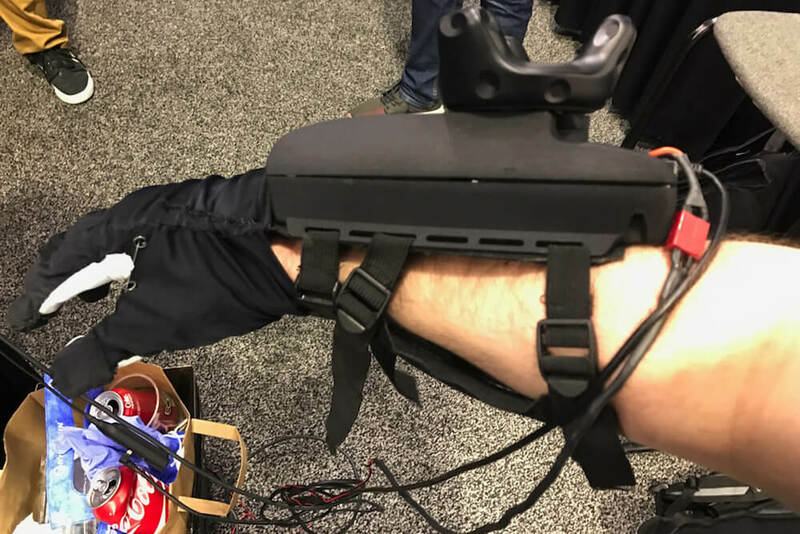 It achieves this through what Contact CI calls “synthetic tendons.” These stop your fingers from moving through a virtual object just as if it were physical. At this point, it cannot simulate weight, however applying the same synthetic tendons to the arms could easily create the sensation of lifting something that has weight. There are always some concerns to consider when sticking your hand into a mechanical device. Fortunately, Contact CI has incorporated safety into the design. To prevent a malfunction or malicious programming from injuring the user’s fingers, the motors providing the force feedback are weak. In other words, if you were to pick up a virtual object, the synthetic tendons would cue your fingers to stop at the surface, but you could still easily overpower them and squeeze through the object to make a fist. There is no word when the Maestro will be released to the public. However, the glove is currently in “early beta testing.” If you are interested in being a beta tester, Contact CI is accepting applications. The idea of actually being able to handle a sword in a VR version of Skyrim, or better yet, feel a gun and pull the virtual trigger in Call of Duty VR is intriguing. However, the last time a glove peripheral was tried it did not fair too well. Nintendo’s Power Glove was a commercial failure. Although, in its defense, Nintendo did only make two games for it and both were flops. Maybe the Maestro will be different.